Edgar Martinez fell short of the 75 percent of the vote needed for Hall of Fame induction, but his trend line is headed up after he collected 58.6 percent. He was at 43.4 last year. 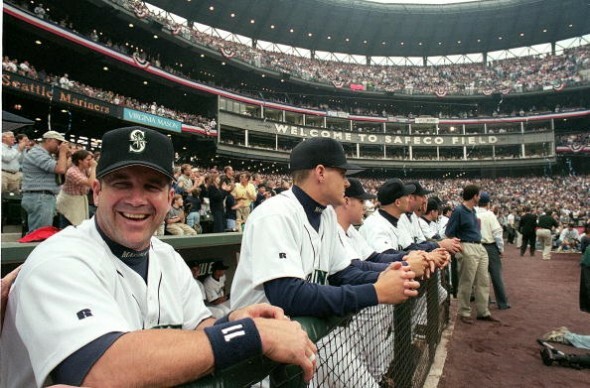 On the ballot for the eighth time since his retirement in 2004, former Mariners DH and current batting coach Edgar Martinez has again failed to generate sufficient support to enter the Baseball Hall of Fame. Needing 75 percent of the vote from the Baseball Writers Association of America for induction, Martinez was named on 58.6 percent of the ballots in results announced Wednesday, not nearly good enough but by far his highest total. The trend line – Martinez received just 27 percent in 2015, then 43.4 percent last year and now 58.6 percent – provides a solid base for Martinez to ultimately bust through, if not in 2018, then in 2019, his final year on the ballot. Jeff Bagwell (86.2), Tim Raines (86.0) and Pudge Rodriguez (76.0) were elected Wednesday while Trevor Hoffman (74.0) and Vladimir Guerrero (71.0) narrowly missed. Martinez received the sixth-most votes this year. Hoffman and Guerrero are prime candidates for election next year, as are two first-time eligibles, Chipper Jones and Jim Thome. That would be a class of four in 2018. Raines was elected Wednesday in his 10th year of eligibility. In his eighth year on the ballot (2015), Raines attracted 55 percent, less than Martinez has in his eighth year. So Martinez remains viable, but has only two years to add 16.4 percent to his voting total. Martinez’s surge of15.2 percentage points, to 259 votes (191 last year) in the latest round of voting can be attributed to several factors, starting with a changing electorate in which older BWAA voters were purged and replaced by younger ones more in tune with sabermetric analysis, where Martinez shines. The Mariners threw a lot of logs on that fire with a vigorous, persuasive blitz conducted by their information staff that specifically targeted Hall of Fame voters. Bulging with exotic statistical comparisons between Martinez and many of the Cooperstown elite, it is difficult to see Martinez as anything but a Hall of Famer. Martinez produced a career slash line of .312/.418/.515, making him one of only 18 players in history with a .300/.400/.500 line for an entire career. In addition to Jones and Thome, next year’s first-year eligibiles will include Andruw Jones and two former Mariners, Omar Vizquel and Jamie Moyer. Trailing Martinez in the voting: Roger Clemens (54.10), Barry Bonds (53.80), Mike Mussina (51.80) and Curt Schilling (45.00). Three former Mariners, Mike Cameron, Carlos Guillen and Arthur Rhodes, were also on the 2017 ballot. None received a vote. Hall of Fame Weekend is July 28-31 with the induction ceremony July 30. 2018 most likely are Jones, Thome, Mussina, Hoffman, Schilling, with Clemens and Bonds being outside barely. 2020 would be Schilling if he doesn’t make it in 2018, Andruw maybe, and so on. He said the big loser will be Vlad Guerrero, who won’t get in even though he was barely short this year. He predicted that newer voters will vote steroids and not be baseball savvy, so will push Vlad off their ballots but say he’s their #11 or #12. He said Vlad could get in next year, but gave him a 40% chance, and falling after that due to changing electorate. Sad.